The quiet state of Nagaland is located in the northeast corner of India. Popularly referred as the ‘Switzerland of the East’, for its unimaginable beauty, Nagaland is the official address for a lot of aboriginal tribes. Every tribe living in this region celebrates their own festivals passed along from generation to generation by their antecedents, which they observe and celebrate with absolute zeal and devotedness. Nagaland is a singular Indian state that has no major event that happens throughout the year! Nevertheless, this write up presents an entirely not-so-typical face of Nagaland. The region literally wakes up on December 1st every year. The glorious instant that activates the whole region is the far-famed Hornbill festival. 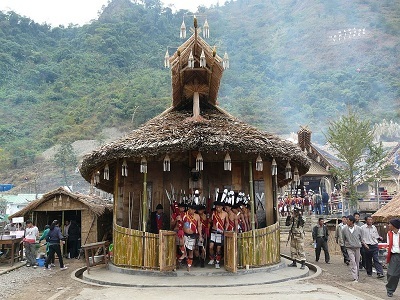 The Hornbill Festival is celebrated at the Naga Heritage Village, Kisama (12 km from Kohima on the National Highway 39). Let's get to know all about the illustrious Hornbill Festival of Kohima. The idea of celebrating Hornbill festival was originally pioneered and suggested by Beauty and Aesthetics Society of Nagaland (BASN) as a Winter Carnival. The conception was then adopted by the Government of Nagaland that relaunched it during December 2000 as Hornbill Festival. The festival was primarily relaunched to boost inter-tribal fundamental interaction and to elevate the cultural heritage of Nagaland. 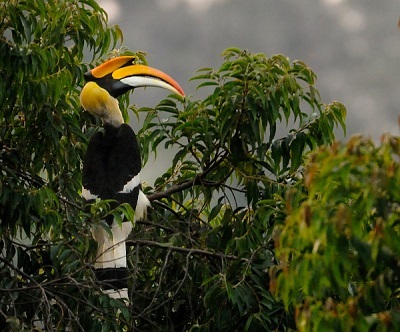 Presently, the Hornbill Festival is organized by the State Tourism and Art and Culture Departments of Nagaland. Today, Hornbill Festival of Kohima is regarded as one of the momentous cultural extravaganzas of North East India. In simple words, the Hornbill Festival is a joyful occasion for special festivities to recreate, protect, nourish, and elevate the Naga heritage and customs. It is a weeklong annual festival celebrated from December 1st - 7th. 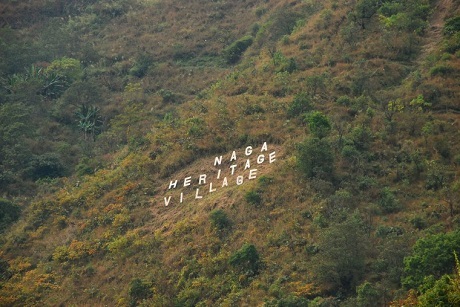 The Naga Heritage Village was permanently set up at Kisama to host the yearly spectacular entertainment of Hornbill Festival. The festival is named after the regional bird Hornbill (Bucerotidae) which is characterized by a long and down-curved bill. The Indian bird Hornbill is exhibited in folklore in many of the tribes of Nagaland. Hornbill Festival is a colorful potpourri of various fetes celebrated throughout the year of about 16 aboriginal tribes of Nagaland. The week long festivities virtually connect the Northeast people as they come together in the same place to show their traditional artistries and craftsmanships. Traditional Naga morungs and hovels are assembled and put up which simply reflects their ethnical belief in high spirits! Furthermore, the colorful festivity is graced with a ethnical pastiche of Naga wrestling, kids festival, handlooms, ethnical foods, traditional dances and songs, handicrafts, car rally, Konyak fire eating demonstration, pork eating contest, beauty competitions, fashion displays, traditional archery, chilly eating contest and native games. Besides, scrumptious native culinary arts are portrayed and treats that are distinctive to each of the tribes are dished up in their respective Morungs along with the top-quality rice beer. The fact that the Hornbill Festival falls on the same day as the Nagaland statehood day (1st December 1963) makes the celebration even more special. From the first edition (December 2000), the Hornbill Festival has just got bigger and better. The last few editions of Hornbill Festival received numerous ethnical companies from several Asian countries apart from the talented troupes from our North-Eastern states. Some of the important cultural troupes from other Asian countries who took part in the last few editions of the festival include Thailand, Japan, Myanmar, Korea and so on. As intended by the Government of Nagaland, the festival has truly gone international! The electric atmosphere, high decibel sounds of warrior log drums, multicolored headdress, mind blowing war whoop, lovely costumes and what not, the Hornbill Festival is one of a kind festival. The Hornbill Festival of Kohima is a jubilation of the yesteryear and the present. It is an ethical extravaganza that not only fetes the tribal path, but also nexuses the break between contemporaries and recreates and brings people together. 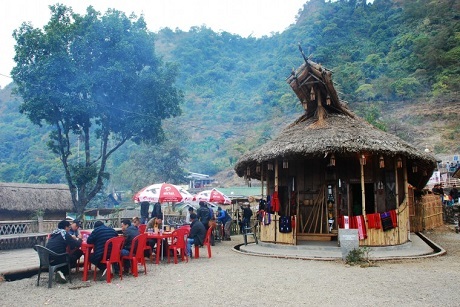 The Hornbill Festival is a charming experience in itself. 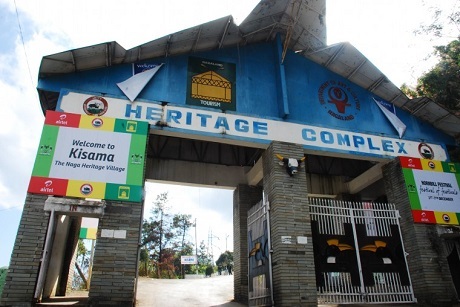 Kisama, the proud host of Hornbill Festival was established primarily for the purpose of the fete. The location got its name from two different villages, that is, 'Ki' from Kigwema and 'Sa' from Phesama while the last part 'ma' means village. The village operates only during the festival. Taxis are considered as one of the best modes of transportation to reach the festival venue (Approx. Cab fare from Kohima to Kisama is Rs. 50).